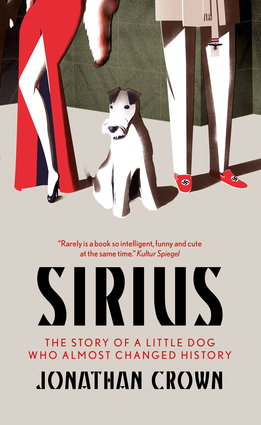 The remarkable story of a fox terrier who changed world history—as a Hollywood star, a circus attraction, and the Führer's lap dogBerlin, 1938: Sirius, a dashing fox terrior, lives a charmed life with the German Jewish Liliencrons. But, with the rise of Nazism, the Liliencrons decide to leave Berlin for Hollywood. Sirius takes his destiny into his own hands with the kind of melancholic mirth exclusive to his breed. He becomes a celebrated film star and circus performer, friend to Rita Hayworth and Cary Grant. But, when a magic trick goes wrong, Sirius ends up back in war-torn Berlin. Never one to despair, he finds himself in the Führer's headquarters as Adolf Hitler's lap dog—and an informant for the resistance. Dictated to him by his dog Louis—Sirius's grandson—Jonathan Crown has at last made this inspiring story available to the non-canine population. Jonathan Crown's fox terrier Louis—Sirius's grandson—told him this family history, Crown simply wrote it all down. This is, therefore, the first ever novel written by a dog.